Web Promotion is a collection of many techniques that serves to the purpose of promoting a website on Web for attracting more visitors to boost up the sales of website's products and services. It includes activities such as Search Engine Marketing, Website Promotion to major search engines in context with good Content Development, SEO Services, Search Engine Marketing (SEM), Classifieds, and Blog Posting & Directory Submission. 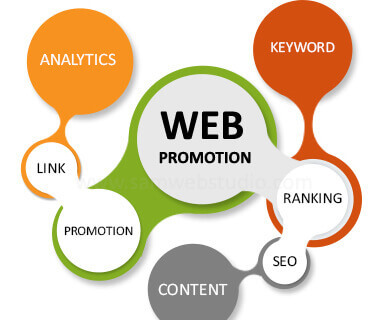 Website Promotion Techniques is an incessant process involving online and offline activities to maintain its web visibility. With growing technology, Web Visibility Standards are taking more leads in the market with internet marketing services. SD Web Solutions, a website promotion company providing website listings on major search engines like Yahoo!, MSN, Google and many more. Our experienced professionals' advice on how to widen up the opportunities of social media users on internet. SEO based content consisting of keywords and phrases, website submission, link building, directory postings that play a major role in generating revenues. We optimize your website and make it consistent for increasing web trafficking on it; hereby popularizing it vigorously through online media.